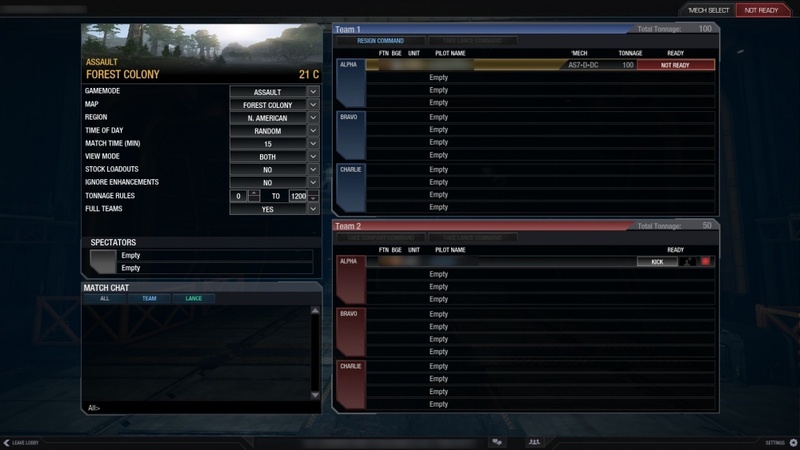 The MWO non-battlefield interface has standard top and bottom menus. Home - Takes you to the landing screen. See Mech Bay for more information. MechLab - See the loadout of your current 'Mech. See Mech Lab for more information. Store - Stock your 'Mech stable. See Store for more information. Comp Play - Takes you to seasonal competitive play. Faction Play - Fight for the Inner Sphere. See Faction Play for more information. Solaris - Duel for your Patrons. See Solaris for more information. Quick Play - Launch into 12v12 battle by yourself or with a group. Hover over the Quick Play button to see game status information. 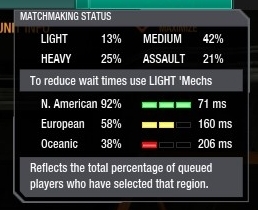 Matchmaker Status shows you the percentage of 'Mech classes playing at that time. Below are the ping for each of the servers: North American, European and Oceanic. The above image was taken from the western coast of North America. The small drop menu to the left of the Quick Play button tells MM which servers you are looking to play on. Only selecting the closest server may reduce your in-game latency, but may increase your wait time as MM creates matches. Exit Game - Exits the game, or return to the MWO launcher. Events - Launches the Events browser. View current, upcoming and past special events. Your status is updated after every match. News - Re-launches the news and promotions window that displayed upon login. Ticker - Scrolling news; used to remind of active events and server maintenance. Chat - Opens the chat window. Lists the names of players that either have accepted your friend invitation or you accepted their's. Listed in alphabetical order, online first. Lists the names of players in your Unit. Listed in alphabetical order, online first. Lists the social alerts you received, such as friend invitations, group invitations or lobby invitations. Join the Looking For Group queue, which allows group leaders to find you. A good way to join a group if you are not already the group leader's friend or in their Unit. Lists the names of players who you have blocked from chat communication. Select one of the names in the Social window opens a sub-menu - send them a message, invite them to your unit, block them from chat, remove them from your friends list, or view their Solaris card. If you are the group or lobby leader you will also see the option to send them a group or lobby invitation. Select the Social window Create Group button to start a group that you can invite friends and Unit members to. Note, if you are a group leader Unit members can see you are a group leader and can directly join your group without an invitation from you. The above group has an Atlas assault 'Mech and a Hunchback medium 'Mech, so the group totals 150 tons. Within a Quick Play group there are combined tonnage limits that the group must stay within, and the limits change depending on the number of players within your group. You cannot form an 11-player Quick Play group, as there are no solo players in the group queue to complete a 12-player team. When each player in the group is ready to drop into the match they click the "Not Ready" button, changing their status to "Ready". The group leader, indicated by the "crown" at the left, can then select the Group Launch button. It has the same server select drop menu as Quick Play. The Mech Select button allows players to select a new 'Mech without leaving the group. Select the Leave Group button to leave the group. If the group leader leaves the group another player within the group is designated as leader. The leader can drag the crown to another player to give them the leader role. Groups are made this way for Quick Play, Faction Play and Solaris (two players maximum). Change the type of group with the Group Type at the top left of the group window. Select the Social window Create Private Lobby to start a tailored match outside of the MWO predefined Modes. You can invite up to 23 other players and two spectators. If the lobby owner invites a group leader, their entire group joins the lobby on the same team. Chosen 'Mechs are not displayed to the other team, but lance assignments and total tonnage are. Invite players to your Private Lobby via the Social window. Game Mode - Choose your game mode. Not all maps are available with every game mode. Map - Choose your map. Not all maps are available with every game mode. Maps prefixed by "[S7]" are Solaris maps, which restrict the number of 'Mechs allowed on each team.. 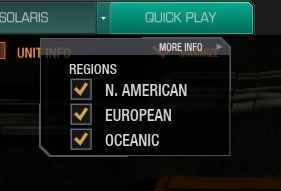 Region - Choose the server that will host your match. Time of Day - Many maps support different time of day environments. Specify the time of day, or leave random. Match Time - Choose how long you match will be; 10, 12, 15 or 20 minutes. View Mode - Restrict view mode to first person only, third person only or allow both. Stock Loadouts - Restrict all player's 'Mech builds to their stock configuration. You may need to reset weapon groups. 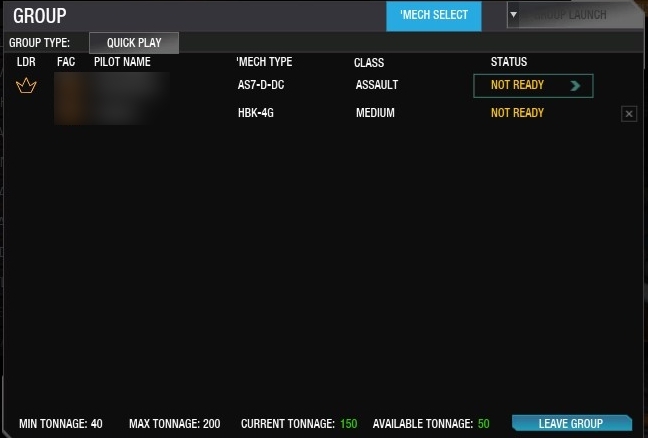 Ignore Enhancements - Removes enhancements due to Skill Tree and default 'Mech quirks. Note without skill tree nodes there is only one consumable slot. Tonnage Rules - Set minimum and maximum total team tonnage. Full Teams - Choose to allow less than 12-player teams. Spectators - One or two players can view the match using spectator tools. Invite them via the Social window like a player, then the Private Lobby owner can drag them to a spectator slot. 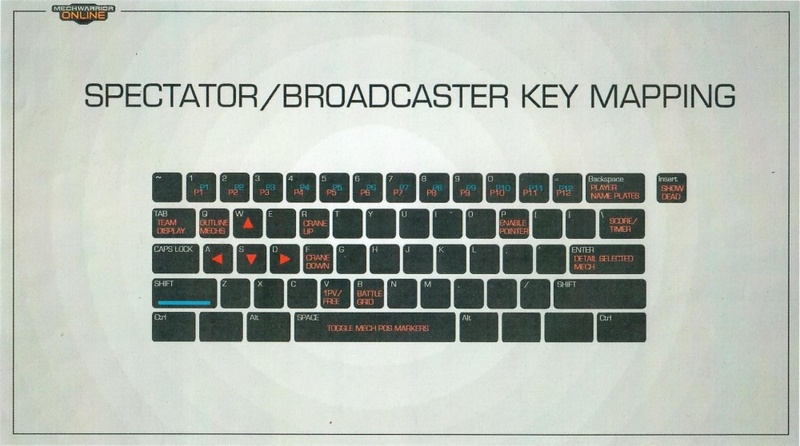 Spectators have total map and 'Mech status information. Once in the lobby players can change their 'Mechs with the Mech Select button at the top right. They cannot change their 'Mech builds or skill tree here, but they can change their consumable loadout. Once every player indicates they are ready the lobby owner can launch the match. This page was last edited on 26 October 2018, at 21:40.